My husband and I had been trying to get pregnant for quite some time. It had been a roller-coaster of emotions for us, and then finally it happened! Luckily for us, we realized I would be pregnant on our favorite night of the year, HALLOWEEN! We got to brainstorming right away. Since we’re saving money, we couldn’t go too crazy with our spending limit, and decided to be a little unorthodox, and be a pregnant housewife and the milkman. We loved our cute little idea, and it wasn’t so hard to put together, (not to mention it was hard to find the energy at that time!) The thing I was worried about most finding, was a milkman hat. The ones online were so expensive, and I really love to put a handmade personal touch, so here’s what I did. I found an old sailor hat, took off the gold tassel, and found a patch. I then took some iron-on vinyl and created the “MILK” template, ironed it on to the patch, sewed it on top of the sailor patch, and voila! For my husband’s shirt we went to a local thrift shop, found a white shirt, and embroidered a unique 50’s name in red to match the hat. His pants and bow-tie were just things we have had around the house. The milk jugs were found from searching for hours upon hours at local thrift stores. 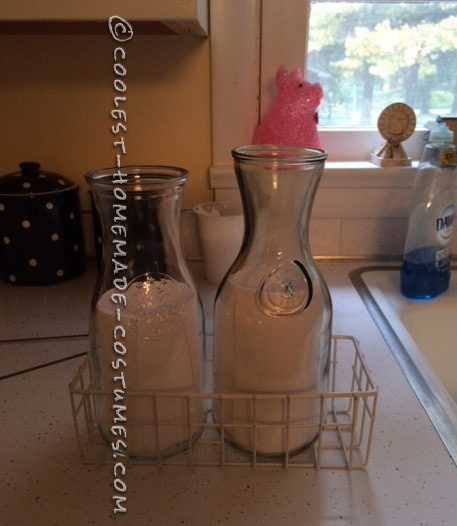 Finally I came upon two, real milk jugs from the 1950s and snagged them for $.99. What a steal! The little wire basket actually came off of my under the sink cabinet that holds sponges and things like that. My husband then took a wire clothes hanger and bent it to fit like handles. That’s how we made the container. Also, inside of the jugs, to appear as if there is milk in them, I cut up white printing paper and inserted it in the jug. People thought he was actually carrying milk! Last was my outfit which was very simple. I had an old polka dot dress that fit perfect for our vision, with a little white shawl, pearls, and red lipstick. The day before our costumes were to be shown, we found out we’re having a little boy. It was such wonderful news for us the day before Halloween. Everyone at the party was laughing at our costumes. They really loved them. We even found a friend dressed up like a cow that insisted on taking a photo with us. This was a great Halloween indeed! Our son is sure going to think his parents are crazy for doing all these nutty things. Thanks for your time and consideration.